Retail businesses face many hiring challenges, including a high turnover rate. Hiring managers look for qualified candidates who are likely to work out long-term and prevent ongoing expenses such as interviews and onboarding. Background checks empower you to find eligible people who have the desired education and employment history. Use our reports to identify ideal candidates who can help reduce your turnover rate and quarterly costs. One serious issue for the retail industry is the unfortunate problem of employee theft. Background reports cannot predict future behavior, but they can show you if a potential employee has a relevant criminal history. If they do, your report will display the charges, disposition and other important details. For long-term employees, we recommend annual backgrounds screenings. They will show you if someone incurs new criminal records while under your employment. Retail businesses must move quickly to keep up with their staffing needs. Backgrounds Online accelerates the hiring process with proprietary tools such as Applicant Self Submittal and fast turnaround times for our background check services. Don't lose out on ideal candidates due to laborious screening procedures. Rely on our expert staff to provide authoritative reports quickly so you can extend offers to qualified candidates before they accept positions with your competitors. Chances are good that your retail business frequently encounters urgent hiring needs. It may seem faster and easier to look up your applicants, check their social media accounts and learn what you can about them with a quick web search. However, it is not legal to make hiring decisions based on information you find online. There are numerous laws that dictate what information can and cannot be used for hiring purposes. It is essential to make sure your screening practices are compliant. Backgrounds Online is FCRA certified, and experienced at building reports for the retail industry. We'll give you the facts you need about potential employees so you can make educated and legally compliant decisions. How do background checks help protect my retail business? They keep you compliant with state and federal regulations. A background check created by a Consumer Reporting Agency can legally be used to make hiring decisions. It is not legal to make hiring decisions based on information you find online or via social media. They show you if someone is qualified for the job. You may have specific educational and employment requirements. Background checks show you if your applicants have the necessary training and history for the position to which they are applying. They inform you of relevant criminal records. If you're hiring someone who will deal with the public and handle cash, then you may want to know about specific criminal convictions in the person's past. FCRA compliant background checks include relevant and reportable convictions that can be used during your decision-making process. Should I screen seasonal employees? A: The best practice is to screen all employees, even if they are only seasonal. This is done to protect your business and keep it compliant throughout your hiring process. A: In addition to standard background check features like identity verification, Backgrounds Online recommends a thorough criminal search for anyone who will handle cash. While it is important to realize a background check is not a predictor of future behavior, these reports provide a thorough overview of a candidate's past. 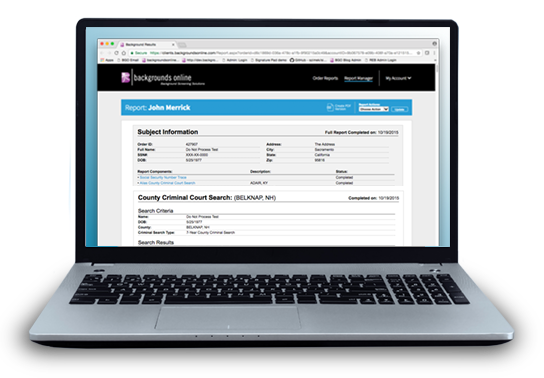 You can use them to see if someone has a criminal record and, if so, learn important details about the conviction. This helps you make educated hiring decisions when screening people for retail positions. Am I required to run background checks for part-time employees? A: There are no laws that stipulate you must run background checks for full or part time retail employees. However, screening your applicants helps ensure you hire the best and most qualified people for any position. If you do screen applicants in any way, then it is essential to comply with FCRA and other regulations. Backgrounds Online remains up-to-date on all such regulations, and will work with you to ensure you are fully compliant. Your retail employees may be required to drive while on the job. For those employees, we recommend a package that includes a Motor Vehicle Record Search.